When I first peruse the dinner menu at Stable restaurant, I feel… neutral. This is perfectly natural, as Stable is a Swiss American restaurant. It’s my husband’s birthday, and the one time during the year when the choice of a restaurant is solely his. I don’t relay my ambivalence over a menu that includes dishes like Schinken Gipfel (Ham and Dijon Mustard Croissant) or Berner Rösti (Potatoes, Bacon, Onion Gruyere Cheese, Fried Egg). It’s not easy for me to keep thoughts like these bottled up, so I’m pretty pleased with myself. I begin to warm up to Stable soon after we enter the restaurant, in the space previously occupied by Ocopa on H Street, NE. The farm house decor reflects the background of business partners Chef David Fritsche and General Manager Silvan Kraemer who grew up in the Swiss countryside. At first glance, the distressed wood tables have that au courant restaurant feel. 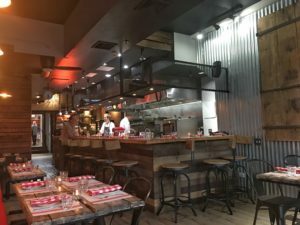 But a deeper look at the barn door nailed to the wall, wrought iron accents, murals of mountains, and red and white checkered napkins, brings about the realization that this interior has something more to say. Stable’s theme ratchets up a notch in the rear of the restaurant, where an enclosed patio includes benches upholstered with Swiss military blankets. My pre-visit ambivalence includes a concern over limited menu options for my kosher dining companions. Veal Zurich style, herb crusted lamb loin, and chicken liver pate aren’t going to cut it. 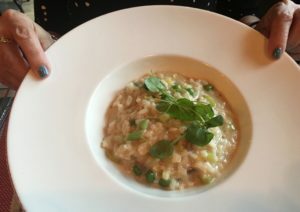 My fears are allayed when my friends set their sights on a season-defining spring risotto with asparagus, peas, morels, and preserved lemon. Plus, there’s cheese. 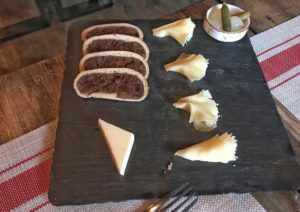 Stable features a raclette dinner experience, which appeals to me as “a must try.” The cheese dish is prepared at the table, and served with boiled potatoes, pickles, and green salad. It’s $35 per person and served exclusively to groups of 4-12 people who reserve in advance. This must wait for a future visit. For now there is the weekly cheese pick, imported from Switzerland. Hoch Ybrig, is an unpasteurized, salty cheese with a sweet finish, which is served with fresh homemade bread. Tête de Moine is a semi-hard cheese, thinly shaved to develop the flavor. It’s accompanied by house made pear bread, which is more of a pastry with a layer of dough surrounding the fruit filling. 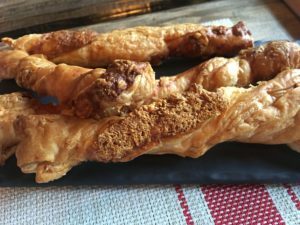 We complete our trio of selections from the haeppli/snacks section of the menu with gruyere and paprika puff pastry sticks. Stable is wooing me, slowly but surely. My admiration continues to ascend with a few bites of a richly satisfying ramp spätzle, with gruyere cheese and a topping of onion crisps. My initial Stable trepidation stems from a perception of main courses that skew on the heavy side. Maine scallops appeal to my desire for something lighter. 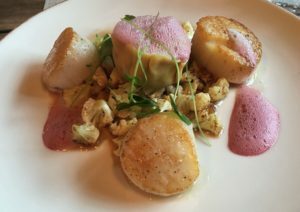 Peak satisfaction is attained with a dazzling display of scallops with cauliflower, a single ravioli filled with short rib, and vers jus- a pink foam made from pressed grapes. The dish is highly acidic, peppery, and sweet. A birthday dinner is incomplete without dessert. Ours is capped off with panna cotta with poached rhubarb, strawberries, candied lemon, and lemon streussel. 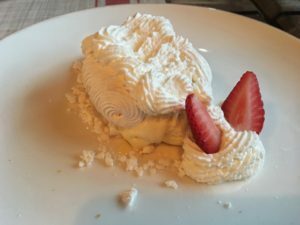 The dessert may be designed to represent some form of wildlife found in the Alps. Or, it may be an allusion caused by the fresh mountain air that now seems to permeate my senses. By meal’s conclusion, my apprehensive mood stabilizes. Neutrality be damned. I am fully committed to the delightfully unique Swiss American restaurant that is Stable.